Mitesh S. Patel, MD, MBA, MS is Director of the Penn Medicine Nudge Unit, the world’s first behavioral design team embedded within a health system. He is an Assistant Professor of Medicine and Health Care Management at the Perelman School of Medicine and The Wharton School at the University of Pennsylvania. 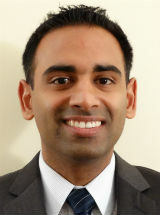 Dr. Patel is on faculty at the Penn Medicine Center for Health Care Innovation and the Center for Health Incentives and Behavioral Economics, and a Staff Physician at the Crescenz VA Medical Center in Philadelphia, and a Senior Fellow at the Leonard Davis Institute of Health Economics. His research focuses on combining insights from behavioral economics with scalable technology platforms to improve health and health care. He has led more than 20 clinical trials in partnership with health systems, insurers, employers, and community organizations that tested ways to design nudges, incentives, and gamification to change clinician and patient behavior. This work includes digital health interventions using wearable devices and smartphones, and health system interventions using the electronic health record. Dr. Patel is Co-Director of the Wharton MBA Course on E-Health and the Perelman School of Medicine Course on Health Care Systems. He has received several national research awards including a Career Development Award from VA HSR&D, a Clinical Scientist Development Award from the Doris Duke Charitable Foundation, 2018 Outstanding Junior Investigator of the Year from SGIM, and the 2018 Alice Hersh New Investigator Award from AcademyHealth. Dr. Patel’s work has been published in leading medical journals including the New England Journal of Medicine, JAMA, Annals of Internal Medicine, and Health Affairs. His work has been featured in numerous media outlets including the New York Times, NBC Today Show, Wall Street Journal, Washington Post, Forbes, Bloomberg, Time, NPR and CNN. Patel MS, Volpp KG, Asch DA: Nudge units to improve the delivery of health care. New England Journal of Medicine 378(3): 214-216, 2018. Patel MS, Day SC, Halpern SD, Hanson CW, Martinez JR, Honeywell S, Volpp KG: Generic medication prescription rates after health system-wide redesign of default options within the electronic health record. JAMA Internal Medicine 176(6): 847-848, 2016. Patel MS, Kurtzman GW, Kannan S, Small DS, Morris A, Honeywell S, Leri D, Rareshide CLA, Day SC, Mahoney KB, Volpp KG, Asch DA: Effect of an automated patient dashboard using active choice and peer comparison performance feedback to physicians on statin prescribing rates: The PRESCRIBE cluster randomized clinical trial. JAMA Network Open 1(3): e180818, 2018. Kim RH, Day SC, Small DS, Rareshide CLA, Snider CK, Patel MS: Variations in influenza vaccination by clinic appointment time and an active choice intervention in the electronic health record to increase influenza vaccination. JAMA Network Open 1(5): e181770, 2018. Patel MS, Asch DA, Volpp KG: Wearable devices as facilitators, not drivers, of health behavior change. JAMA 313(5): 459-460, 2015. Patel MS, Benjamin EJ, Volpp KG, Fox CS, Small DS, Massaro JM, Lee JJ, Hilbert V, Valentino M, Taylor DH, Manders ES, Mutalik K, Zhu J, Wang W, Murabito JM: Effect of a game-based intervention designed to enhance social incentives to increase physical activity among families: The BE FIT randomized clinical trial. JAMA Internal Medicine 117(11), 2017. Chokshi NP, Adusumalli S, Small DS, Morris A, Feingold J, Ha Y, Lynch MD, Rareshide C, Hilbert V, Patel MS: Loss-framed financial incentives and personalized goal setting to increase physical activity among ischemic heart disease patients using wearable devices: The ACTIVE REWARD randomized trial. Journal of the American Heart Association 7(12): e009173, 2018. Patel MS, Asch DA, Rosin R, Small DS, Bellamy SL, Heuer J, Sproat S, Hyson C, Haff N, Lee SM, Wesby L, Hoffer K, Shuttleworth D, Taylor D, Hilbert V, Zhu J, Yang L, Wang X, Volpp KG: Framing financial incentives to increase physical activity among overweight and obese adults: A randomized, controlled trial. Annals of Internal Medicine 164(6): 385-394, 2016. Patel MS, Asch DA, Rosin R, Small DS, Bellamy SL, Eberbach K, Walters KJ, Haff N, Lee SM, Wesby L, Hoffer K, Shuttleworth D, Taylor D, Hilbert V, Zhu J, Yang L, Wang X, Volpp KG: Individual versus team-based financial incentives to increase physical activity: A randomized, controlled trial. Journal of General Internal Medicine 31(7): 746-754, 2016. Case MA, Burwick HA, Volpp KG, Patel MS: Accuracy of smartphone applications and wearable devices for tracking physical activity data. JAMA 313(6): 625-626, 2015. Patel MS, Volpp KG, Rosin R, Bellamy SL, Small DS, Fletcher MA, Osman-Koss R, Brady JL, Haff N, Lee SM, Wesby L, Hoffer K, Shuttleworth D, Taylor DH, Hilbert V, Zhu J, Yang L, Wang X, Asch DA: A randomized trial of social comparison feedback and financial incentives to increase physical activity. American Journal of Health Promotion 30(6): 416-424, 2016. Sedrak MS, Myers JS, Small DS, Nachamkin I, Ziemba JB, Murray D, Kurtzman GW, Zhu J, Wang W, Mincarelli D, Danoski D, Wells BP, Berns JS, Brennan PJ, Hanson CW, Dine CJ, Patel MS: Effect of a price transparency intervention in the electronic health record on clinician ordering of inpatient laboratory tests: The PRICE randomized clinical trial. JAMA Internal Medicine 177(7): 939-945, 2017.